PLANT NAME: Pandanus tectorius S. Parkinson ex. Z. 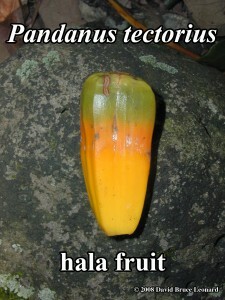 COMMON NAMES: Hala [Hawai’i]; screwpine [English]; fa [Tonga]; ketaki, kewra [India]; palma de tornillo [Colombia]; toei-hom (P. odorus) [Thailand]. 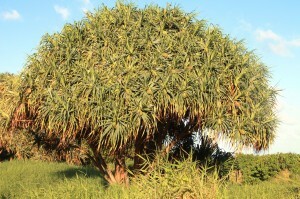 Although Pandanus is used as food all over Polynesia, the varieties that grow in Hawai’i are waxy and not terribly edible. In a pinch the tips of the ripe seeds may be eaten raw or cooked and stored for later use but they must be cooked for a long time due to calcium oxalate crystals that are destroyed through cooking. Some species of Pandanus contain significant amounts of provitamin A carotenoids [Englberger 2003]. The orange seeds contain more than the yellow ones. TOXICITY: The LD50 of water extracted P. odorus in rats is 1.18-2.76g / kg for intraperitoneal injection, and 8g / kg for oral administration [Peungvicha 1996]. New Caledonian crows (Corvus moneduloides) have been shown to use Pandanus plant materials as three distinct types of tools. Oddly enough, they also demonstrate ” species-level laterality” i.e. they have a right and left-handedness, with one side strongly predominating. The crows that is, not the plants [Hunt 2000, 2004]. In a Chinese medicine clinical context, the aerial roots are sweet and cool and rather pleasant tasting. They release the exterior and drain dampness. They are similar to Chrysanthemum morifolium (ju hua), in that they also clear heat in the upper part of the body and seem to smoothe the flow of liver qi. Pandanus has the advantage of being easy to find and accessible as the need arises, although the hinano (male flower) can be hard to come by. The taste of the aerial root is surprisingly pleasant, as is the fruit in decoction. Acupuncturists will find the aerial roots useful as a diaphoretic and diuretic. 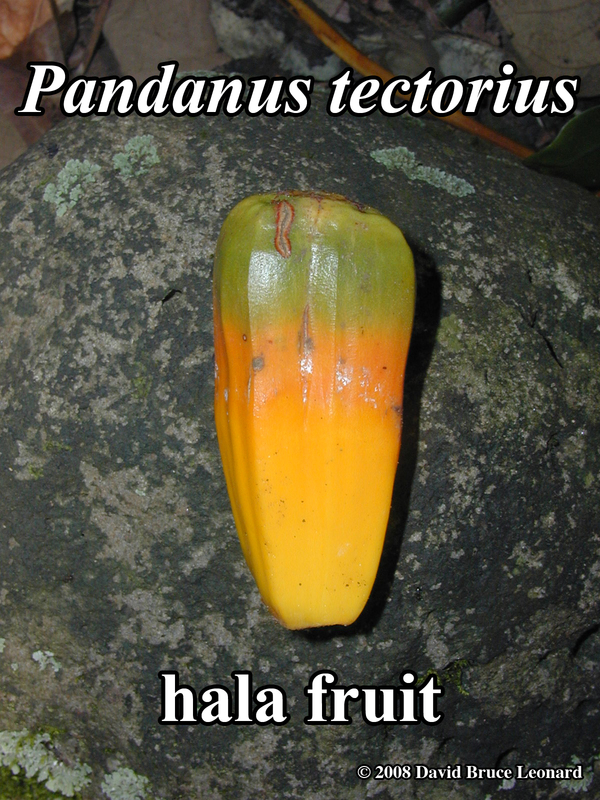 The ripe fruits, while sometimes difficult to find, are well placed in formulas for qi deficient low energy and blood deficient irritability and insomnia. For use as medicine boil all parts of the plant for a minimum of 45 minutes.